In my town in New Jersey, there’s an annual garbage pickup that people call junk day. For a small fee, residents can put out their bulky trash. We missed the permit deadline in 2011–and regretted having to go another year with a broken children’s dress crowding our garage–so this time, we got ready early. We unloaded some big things, like a sofa in our family room that had seen better days and a beat up file cabinet in my office. As we put out these items, we noticed people driving around town in pickup trucks and vans, looking for things they could use. Most of our old stuff disappeared this way, and by the time the official collection came, only that badly beat up, unusable dresser and a broken patio umbrella remained. I was surprised how much more productive I’ve felt at work since we unloaded this stuff. It’s been much nicer to write and edit in my my home office now that the file cabinet is gone. And when I emerge and walk around my house, it’s a more streamlined version (not an easy thing to achieve with four small kids). 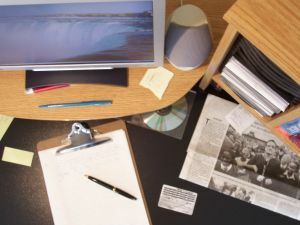 If you, too, have been feeling weighed down by clutter around you, here are some good sites to help inspire you to clear your work space, and home, so you can concentrate. Freelance Writing Dreams: This blog offers a manageable, five-day plan to bring more simplicity to your life and greater productivity. 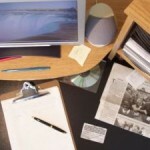 Organized home: Declutter 101: Strategies to Cut Clutter offers some smart, simple methods for going through your stuff. The Happiness Project: Gretchen Rubin offers some clever ways to use spare moments in your day to keep the tide of clutter from taking over your space. It’s hard to declutter all at once, especially if you’re busy meeting deadlines. But even unloading a fraction of your unwanted junk can make a difference, especially if you work from home, as I discovered. Now, onto that pile of old files to shred!